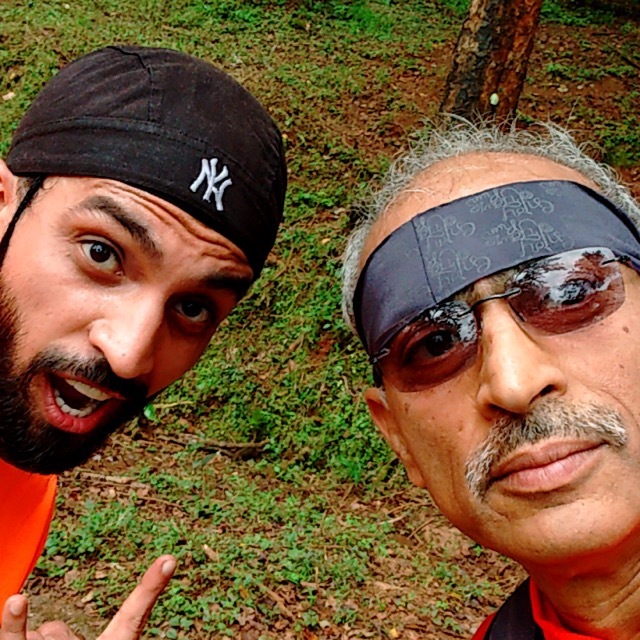 I heard about Malnad Ultra from Hari Shankar (0ne of the 80k runners at Malnad) in August. I was recovering from a heel injury and was on a diet of slow runs. Thats when I decided to attempt my first 50k. 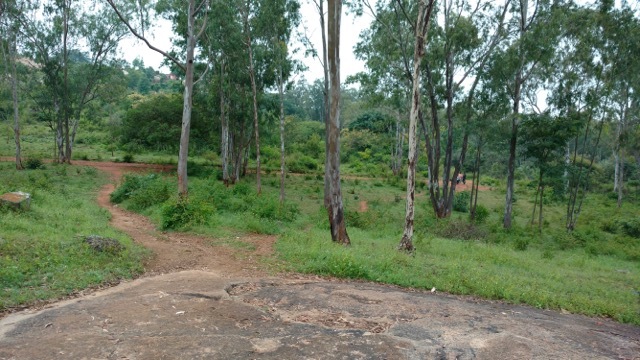 Hari and I decided to do the long runs together and ran in and around Turhalli forest. My training volume was around 6 to 7 hours of slow running per week. All my runs ended in a climb to my 10th floor apartment. 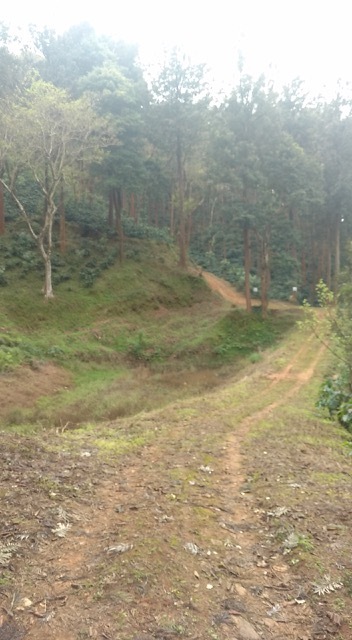 My nervousness grew as I started to explore the Malnad Ultra Website, the routes elevations etc. What dawned upon me is that the 9 hour cut-off for 50k was not without good reason and I cannot apply the same yardstick to estimate finish time as I do to flatter trails or roads. I estimated my finish time between 7 to 8 hours for 50k based on walk/run plan i.e. 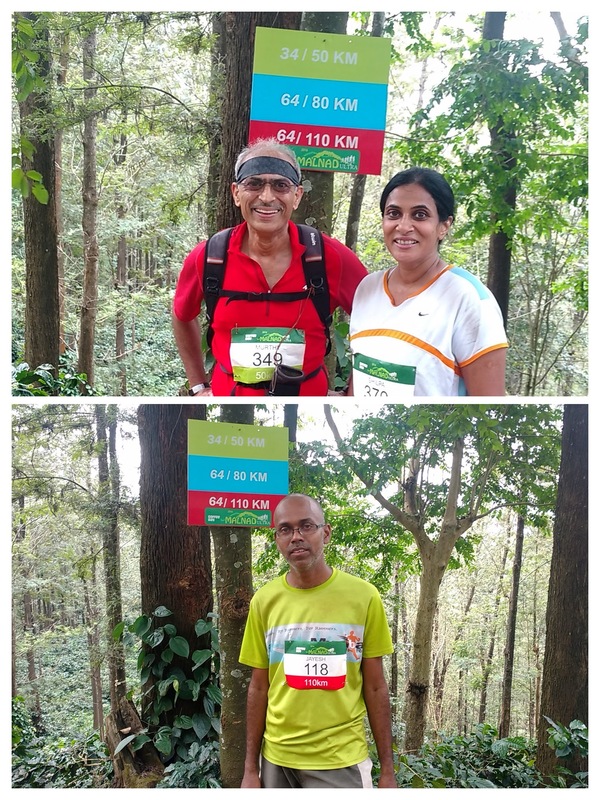 walk uphills greater than 2% gradient and run downhills at easy relaxed pace (check here in case you are interested in kilo-meter wise gradients for 50k, 80k 110k (Note added on 26th Sep 2017 : the 80k and 110k routes have changed in 2017 whereas 50k is more or less the same) . I was a bit cautious in my estimate as I had never done anything beyond a full marathon and had the tendency to bonk at 30 plus km. The 6:00 am Janshatabhdi Express to Birur looked special as majority of the passengers were runners and the photographers, Ramesh and his colleague, got very busy clicking in the train. Made friends with Shiva who was also running 50k…. 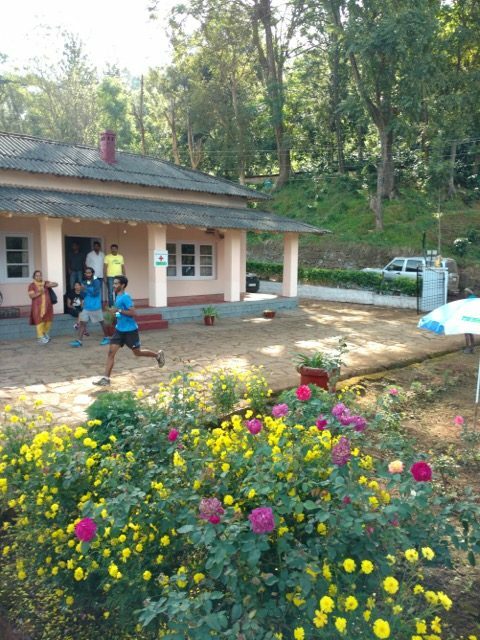 The Malnad Ultra staff welcomed us just outside Birur Station, we then headed to Kemmangudi to collect our bibs. 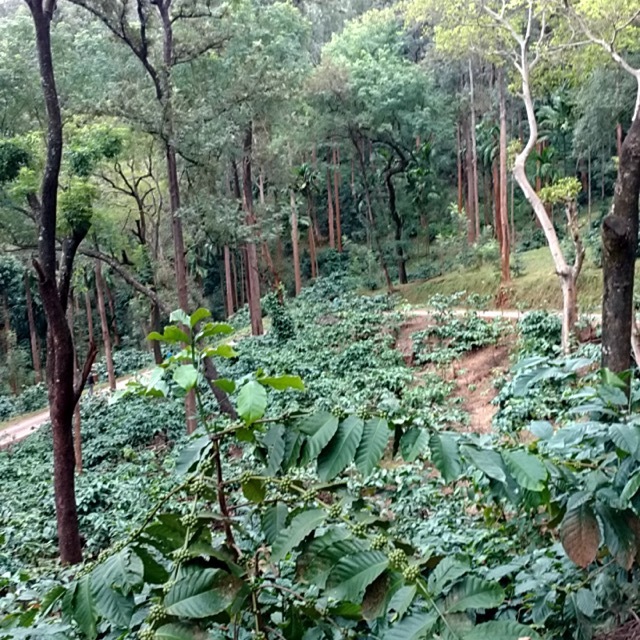 The registration at Kemmangudi was a short steep hike from the parking lot – gave us a taste of things to come. After collecting our goodies bag and bib we headed to the LAST RESORT (what a name, we still joke about it!). The pre-race talk was good as it clarified most things and had the right emphasis on rules to ensure the safety of all runners, thanks to Anand and team. The talk was followed by a sumptuous dinner. 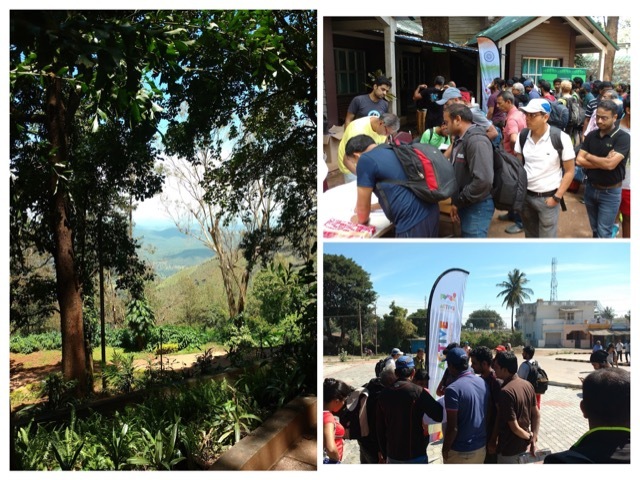 Wish we had ended early to rest – well that is something for organisers to think for the 2017 edition of Malnad Ultra. Sampath approaching 30k mark at Lalbaug. We left the LAST RESORT at 6:15 am by bus, after a short adventure, which included switching buses, losing our way etc, which all ended well we reached Lalbaug Estate, the 50k start point just around 8:00 am. The packed breakfast arrived, I had a couple bites of the sheera. at 8:50 am the first runner arrived (the 80k and 110k runners started at 6:00 am and the 50k start point was their 30k mark!) covering 30k in 2:50! 9:00 am: the 50k runners were flagged off. 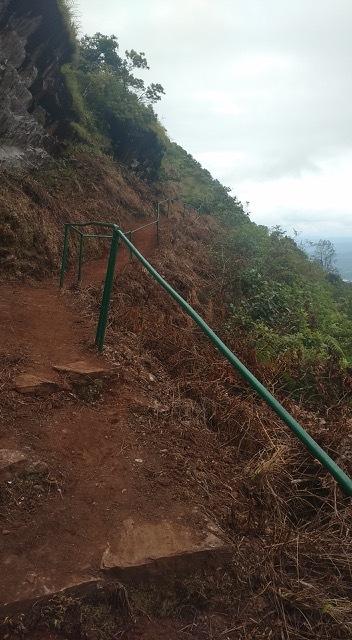 The first 4k was a tar road going downhill, I was fairly relaxed and avoided being tempted by it – kept my pace slow and easy…….the thought of climbing this on the return crossed my mind. 9:30 am: I met Bhavdeep, who was my room partner at the LAST RESORT. We chatted a bit and took a selfie! I could not fully capture all the scenic beauty on my mobile but here are some pictures till I hit the 17-18k mark. The approach to the summit was steep and single trail. I reached the summit at around 11:15 and was feeling a bit tired. I took a gel and some water to ensure I had the energy to make progress. I started to feel hungry at around noon somewhere between 20 and 22k (one good thing about the distance markers were there was one every 2k and it was one of the most pleasing sights to see a distance marker. It felt like a lot of progress). Lunch was waiting for us at 28k. Somewhere in between 22 and 28k, there was an aid station which had boiled eggs. for the first time in a long run I have tried eggs and it seemed to have worked for me. At around 13:30, I approached the rest area as Shilpa was leaving the rest area. Shilpa looked strong and was firing on all cylinders. Brijesh, one of the run managers, explained to me what to expect in the next few k’s and not to blame him for the torture! I met Vijaya as I was leaving the rest area. 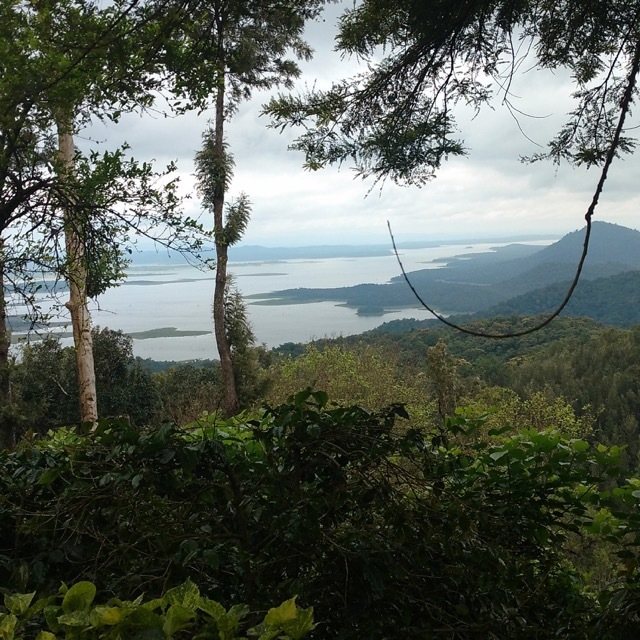 Post lunch climbs were torturous, the mere sight of it made me wonder – why did I sign up for this run! The uphill seemed endless. At every bend, I was expecting a downhill but this one was different – it kept going up and up and up…….for about 3k or so. I caught up with Shilpa somewhere between 33 and 34k and we started to run together also met Jayesh (110k runner) and took some pictures at the 34k mark. The next 6 odd km was a good downhill with a few short uphills in between and this is where I really made up for some lost time. At around 40k I reached the emerald green lake (regret not having a picture) but the photographer obliged – posed for a photo with the lake in the background. Spent some time hydrating and filling but my water bottle. Reached the 42k mark at 15:00 hours – a good six hours from start. The last 8k contain two brutal climbs one 2k and the other 4k towards the end. It took me another 1:25 to cover the 8k but did run the last 10m to the finish line and made it in 7:25 well within the target I set for myself 🙂 I was extremely pleased with the outcome. If you put in the effort on the climb you will always be rewarded with a downhill! Last but not the least, I would like to thank the Malnad Ultra Race Director Anand and his team for having planned and executed this event and wish more such events in the coming years. Congratulations Ganesh Sir !! for having completed Malnad Ultra ! !